A few years ago, Russian journalist Natasha Nemirova proudly posted in her internet blog some pictures of her latest fashion find: a pair of valenki – traditional Russian felt boots – coloured white, with blue flowers embroidered on them. At the time, Nemirova’s decision to choose valenki for her winter wear put her in the minority among fashion-conscious Muscovites. Everywhere, people were wearing Uggs. Although Russians have been wearing valenki for centuries, they lost much of their appeal for Russia’s urbanites in the middle of the 20th century. Traditional valenki were made of dried sheep’s wool and had no hard soles. They were usually produced only in black, gray or white, and to protect the valenki from mud, they had to be worn with rubber overshoes – not a particularly attractive look. And so as more options became available to fashion-conscious consumers, valenki were replaced in Russian cities with lighter, more water-resistant boots. Then, Uggs entered the Russian market. They quickly became known as “Australian valenki” because of their strong resemblance to the traditional Russian footwear, and suddenly designer felt boots were making their way into the pages of fashion magazines. Today, valenki come in various colours and are embroidered with designs ranging from ones aimed at children to elaborate modern concepts. They can be decorated with print or made with fur trim. 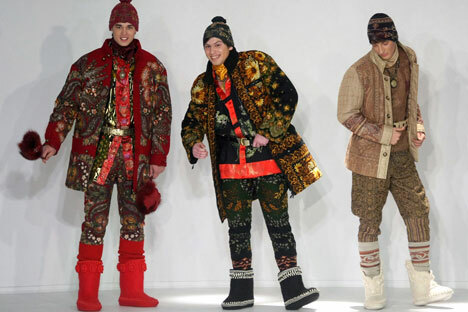 They are not just keeping Russian city goers' feet warm in winter, they are glamorous, customised pieces of folk art. “They are popular among young and old, rich and poor. There is a great variety of models – short and tall; for slim feet or for stout ones; with narrow or wide top. Some of them (have) flowers or snowflakes to appeal to a younger audience. Some valenki are more traditional, black or white. The choice is indeed tremendous,” Mr Larin said. Denis Detkovskii, head of the sales department at the Russian footwear producer Elche, claims that his company was the first to produce “the new valenki”, or city valenki. “Our company started producing them three years ago. There was nothing like today’s valenki on the market back then. Three years ago, our designers created new models and developed new looks. We started showing them at various exhibitions, and people got truly interested,” Mr Detkosvkii said. The competition between Uggs and valenki has been attracting plenty of popular attention in Russia. Various groups on social networks and blogs are consumed by the debate over which brand is more hip. Mr Larin, from the Uggi-Valenki internet store, even included a counter on his website to show the sales of Uggs compared with those of valenki. “The competition is very tight. They are battling neck and neck,” Mr Larin said. Tatyana Efimova, who is from a family who have been felting valenki for 15 years, agreed with Mr Larin. “I do feel that valenki are getting more popular today. People are no longer afraid of the word 'valenki'. They enjoy wearing them,” she said. Ms Efimova and her family make valenki with no hard soles, but even this long-time producer from the central Russian Republic of Chuvashia has succumbed to the new trend of decorating the valenki with embroidery and buttons. Also, they have been selling their valenki with silicone see-through covers, which look much more attractive than their traditional, black predecessors. “One day, seamstresses started buying valenki from us. I first watched them doing their job, then came up with my own ideas and started embroidering them myself. Today, I employ several seamstresses,” Ms Efimova said. But others may jump at the opportunity to compete with Uggs globally. Mr Detkovskii, of the Elche footwear company, said his company “has plans” to enter foreign markets.